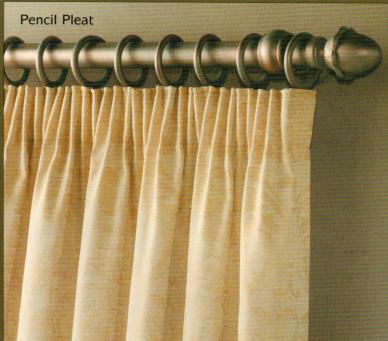 Pencil Pleat is the most common of all headings and is the modern version of standard tape or ruffle tape. Ruffle the Fabric to create the Pencil Pleat. This heading can be found on every pre packaged curtain available but is still sometimes made to measure or bespoke using exclusive fabrics. This heading is also used for most commercial applications, due to its speed in making up the curtain. 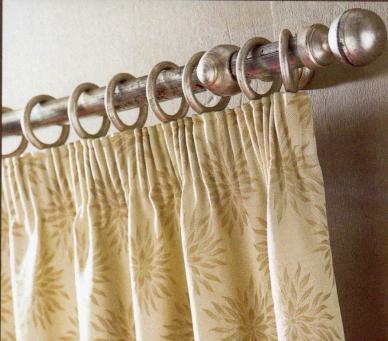 The down side to the Pencil pleat heading is the curtain stack back is very large compared with other heading styles. but the pencil pleat heading has the worst dressing record, as is very difficult to keep neat and tidy. On the positive side of this heading, if you want a messy look or a very old traditional look then the pencil pleat heading is for you or if you have a second home and want to keep the cost to a minimum. Pencil Pleat is nearly always Machine Made and not hand made.